Pandas have become a worldwide symbol for animal conservation thanks to the WWF’s use of them as its logo, but many people do not know just how bad the plight of these beautiful animals really is. Whilst the panda's status has been made less severe thanks to panda conservation efforts, moving from endangered to vulnerable, there is still more that needs to be done! Pandas are in dire need of your help as they are losing their natural habitats at an alarming rate due to human development, and even their food supplies due to over-harvesting of bamboo. These famous creatures may have come off of the endangered list, but an increase in panda conservation efforts is still needed to ensure they have a chance of survival. Pandas are facing a whole host of threats, and although one of the main problems these bears face is their incredibly slow reproduction rate, there are other problems such as hunting and habitat encroachment that we as humans have the power to prevent. 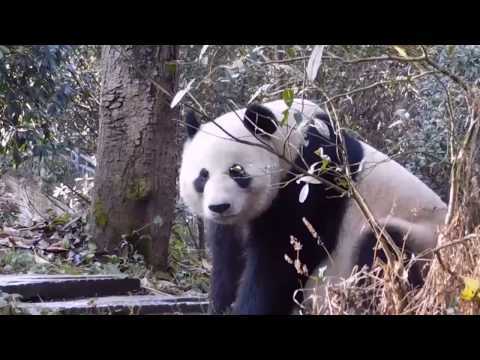 We can offer you the chance to participate in a panda conservation project in their endemic home of China. So, what are you waiting for? Get stuck in and secure your place to aid giant panda conservation today! In 2016 the status of giant pandas was moved down from endangered to vulnerable, but that does not mean they are out of the woods just yet and there is still work that needs to be done. It is estimated that there are around 1,800 pandas left in the wild, but due to their sometimes elusive nature, it is hard to get an accurate gauge on their numbers. As they are endemic to only one country, the panda population can be drastically affected by any small change in their local environment, and this further endangers the bears as they would find it hard to recover. Panda sanctuaries are beginning to play a much more prominent role in the protection of these bears, and as a result, volunteers are becoming crucial in the battle of panda conservation. Human encroachment – with China home to the world’s panda population, also playing host to the largest population of humans in the world, space is at a premium and this has resulted in humans inadvertently removing pandas from their natural homes. Low rates of reproduction – breeding season for pandas is normally only a few days per year, and panda mothers normally only produce 1 or 2 offspring each year which means it can take a long time for numbers to recover. Hunting – efforts have been made to stop panda hunting in China, but pandas are still sometimes caught in traps that were intended for other animals. 99% of a panda's diet consists of bamboo, which is low in nutritional value, but they are able to digest other foods so it is a bit of a mystery as to why they continually choose to eat this plant. The giant panda is actually a bear, which is contrary to what many people believe. They can live for up to 20 years in the wild, and as they have no natural predators when they reach maturity they are free to graze away at the bamboo they love so much! Pandas are a crucial part of their ecosystem, as they spread seeds within their dropping and thus help vegetation to thrive and naturally regenerate. the Giant Panda was revealed to the west in 1869 when a French missionary received a skin from a hunter.